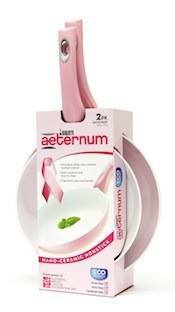 10 winners will each receive a pair of Bialetti Aeternum pink fry pans! Bialetti is quality cookware and this new Aeternum Pink sauté set is no exception. The 2-pack set includes 9.5-inch and an 11-inch pans—perfect for cooking up lots of healthful meals. (each a $50 value)! CLICK HERE for more details and to get entered! Enter by Wednesday, October 10 at midnight.